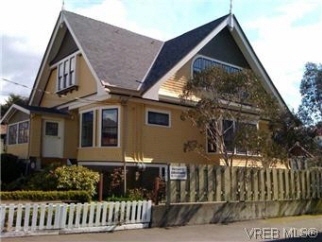 Here is an opportunity you have always desired to finish this 1908 heritage strata home.The seller has completed the outside of this fine edwardian arts and crafts home with steeply pitched roof, side dormers, corner porch balanced by bay window.Located in victoria"s heritage james bay area location. Only steps to the beach front and dallas promenade as well as becon hill park and downtown. There is over 2600 sq to work with and a full usable basement for you to finish. Easy care, large garden allows for your outside living enjoyemn.Lovely setting .Enclosed porch is ideal for the lazy afternoon days watching horse drawn carriges drive by.The inside is completly unfinished.Strata. Appointments for viewing is a must. Additional Features and Amenities Other: Bsmt: Finished - Not, Ext Fin: Wood, Found: Concrete Poured, Fuel: Other, Heat: See Remarks, Kitch: 0, Roof: Asphalt Shingle, Waste: Sewer, Water: City/Munic.